I love World Cup season. No matter where I am in the world, it brings me joy to find international clusters of people huddled around televisions and to hear multilingual cheers and sporadic honking in the streets. 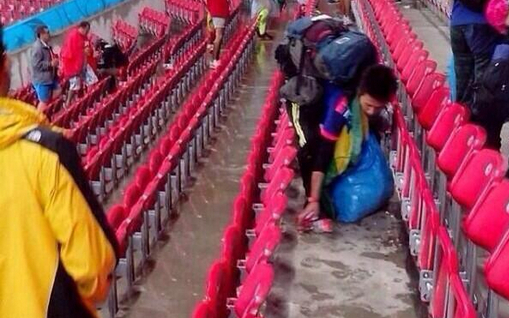 I also love all the colorful news coverage the event sparks, like this amazing story about Japanese fans in Rio sticking around to clean up trash in the stadium after their team lost to Cote D’Ivoire. I love this story so much. Also, sorry I haven’t posted in a while, much more to come. 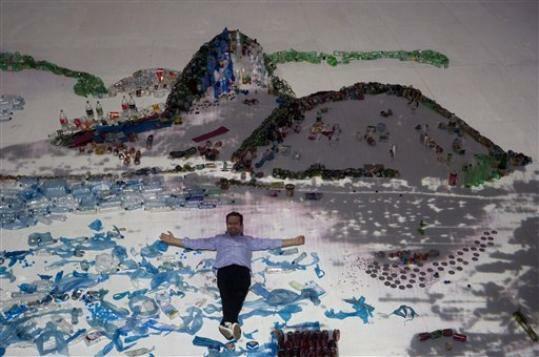 Brazilian-born, New York-based artist Vik Muniz has set up his latest project in Rio de Janeiro, timed with Rio+20, the United Nations Conference on Sustainable Development. Appropriately entitled Landscape, Muniz’ new work recreates Rio (the global capital of debate around the environment) entirely out of trash. You probably remember Muniz from the incredible documentary Waste Land. Anyway, that is to say I was feeling pretty jaded and exhausted by the mere thought of all the hustle and bustle and tedious bureaucracy orbiting around a meeting of this size and pomp. Until I read about this new Vik Muniz endeavor. Suddenly, I’m jealous of all the activists and diplomats packed into conference rooms and pouring over the past twenty years of progress (or lack thereof) on issues of sustainability. Those bastards get to slip out and visit amazing trash art projects! I wonder what other creative efforts environmentally-minded artists have cooked up for this occasion. Are you in Rio? Send updates and photos, please!